​Three piece light construction precision CNC machined from light alloy material. 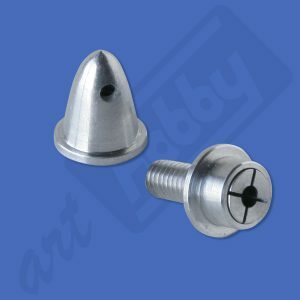 Standard 5 mm mount are compatible with APC and similar propellers. Outrunner, Inrunner and Geared motors with 4mm shaft diameter. 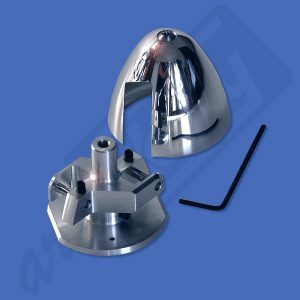 Two piece very light construction precision CNC machined from Dur-alloy material. and 8×4.5, 9×5, 11×8 CAM blades (Graupner). Outrunner and Inrunner motors with 3.00 mm shaft diameter. Outrunner and Inrunner motors with 3.17 mm (3.2 mm) shaft diameter. Designed by ART HOBBY and Made in Poland. 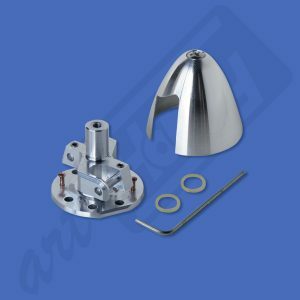 Two piece spinner, very light construction is precision CNC machined from Dur-alloy material. 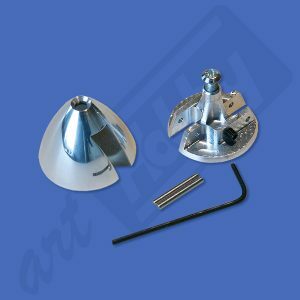 Art Hobby designed this spinner to have internal-offset blade mounts. When flying with motor OFF, those features allow blades to retract flat against glider fuselage reducing air drag to minimum. This is very important because most flying time in electro-glider the motor is turned OFF and blades are folded. Spinner also have two internal posts for installing small rubber bands that help to keep blades folded tight against the fuselage pod all the time during flying when motor is turned OFF. The spinner is nice shaped to complement our electro-gliders fuselage pods and most other fuselages on the market. All around is enhancing gliders finale appearance. This spinner is compatible with Aeronaut and Graupner CAM blades. Outrunner and Inrunner Geared motors with 4mm shaft diameter. Outrunner and Inrunner or Geared motors with 5mm shaft diameter. 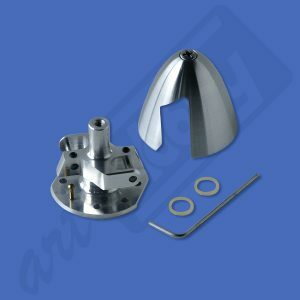 Two piece, very light construction is precision CNC machined from Dur-alloy material. We designed this spinner to have internal-offset blade mounts. When flying with motor OFF, those features allow blades to retract flat against glider fuselage reducing air drag to minimum. This is very important because most flying time in electro-glider the motor is turned OFF and blades are folded. Spinner also have internal provisions for installing small rubber bands that help to keep blades folded tight against the fuselage pod all the time during flying when motor is turned OFF. The spinner is nice shaped to complement many fuselage pods of the gliders and all around is enhancing gliders finale appearance. The spinner is suitable for Aeronaut and Graupner CAM blades. Outrunner and Inrunner Geared motors with 5 mm shaft diameter. Designed by ART HOBBY and Made in USA. Outrunner and Inrunner Geared motors with 6mm shaft diameter.